As mentioned in our previous post, we’re catching up looks you may have seen on our Instagram already. Today, we are sharing 3 hip jeans to rock this summer! Am I dating myself too much if I say that these aren’t apple bottom jeans, but they are tassel bottoms! Bad jokes aside, I love the tribal/music festival feel of the printed ribbon on the bottom of the jean. Although I own several pairs of jeans, they’re not my go-to choice for feeling fashionable. So it was the bit of extra embellishment that caught my eye for this look. A cold shoulder top is perfect for keeping cool in the summer heat and amping up the summer vibes. Denim, denim, denim. I know, I told that joke the last time I wore double denim, it was actually triple denim, but that was so last year. In any case, I fell in love with this quirky denim top. It was only after I received it that I realized I couldn’t figure out how to wear it! Such is the life of the fashion love. Maybe it’s fashion’s attempt at cerebral fashion, a sort of fashion puzzle. Figure out how to wear the shirt and you’re qualified as a genius. Really though, this look was all kinds of trouble, as the Zara jeans didn’t fit, even though I ordered them in my usual Zara size. I then ordered a size up and they still didn’t fit. So, we took the picture, and now I’m stuck with two pairs of gorgeous jeans that cost way too much and don’t fit. Jeans shouldn’t fail you. They’re too easy to get right. Although I love this look, it’s a total jean fail. Don’t let the picture fool you. Just call me that so 70’s chick. 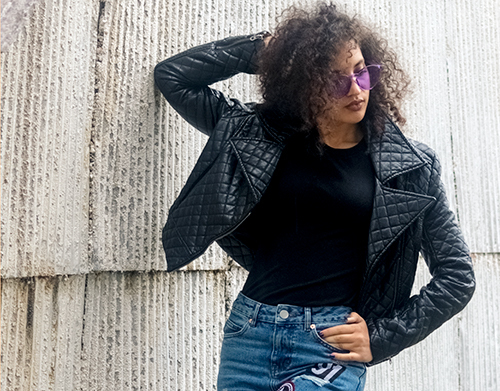 For this look, I paired a quilted leather jacket with Asos patch embellished jeans for a cool rocker style. Don a pair of colored glasses and the 70’s vibe is all the way live. There you have it — 3 hip looks for your summer fashion jeans.